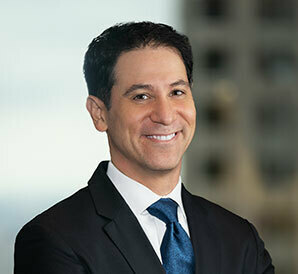 David is the leader of the Patent Law section of the Firm's Intellectual Property Group, as well as a partner in the Corporate & Securities and Litigation Groups. With more than 18 years of experience as an intellectual property litigator and counselor, he represents large market cap to small privately-held clients in a wide range of industries, including electrical, software, and mechanical technology. David's client services include licensing, negotiations, litigation, patent portfolio development, product clearance, and structuring intellectual property provisions. David has more than 18 years of experience in matters before the United States District Courts, the Court of Appeals for the Federal Circuit, United States Supreme Court, International Trade Commission, and United States Patent and Trademark Office (USPTO). He leads trial teams, resolves patent infringement demands, and has argued on behalf of co-defendant groups. He has prepared petitions for inter partes review (IPR) in the USPTO and argued before the Patent Trial and Appeals Board (PTAB). David became registered to practice before the USPTO while still in law school. David is a member of the Trial Bar of United States District Court for the Northern District of Illinois. David's transactional experience involves a wide range of technology matters, including a central role in providing guidance for the intellectual property acquisitions and deal evaluation for clients. He negotiates and drafts license agreements, evaluates joint development and acquisition targets, conducts product clearance, prepares invalidity opinions, and assists in patent portfolio enforcement strategies. He also helps to create and manage patent portfolios for large companies and startups. David also advises clients on protecting their key data through contractual obligations and intellectual property rights. With a technical background in electrical engineering, David has in-depth knowledge in electrical, mechanical, and software matters, including computer networking hardware, wireless communications, biomedical devices, computer software, hearing instruments, gaming, signal processing, valves, mechanical assemblies, green technology, vehicle navigation systems, plastics, office seating, internet-based applications, and monitoring systems. Prior to joining the Firm, David began his legal career at an intellectual property boutique law firm, starting as a law clerk during law school and concluding as a partner, then he moved to an international law firm.